A one on one yoga practice with a certified yoga instructor to look closely and help you dive deeper into your personal areas of interest in your practice. 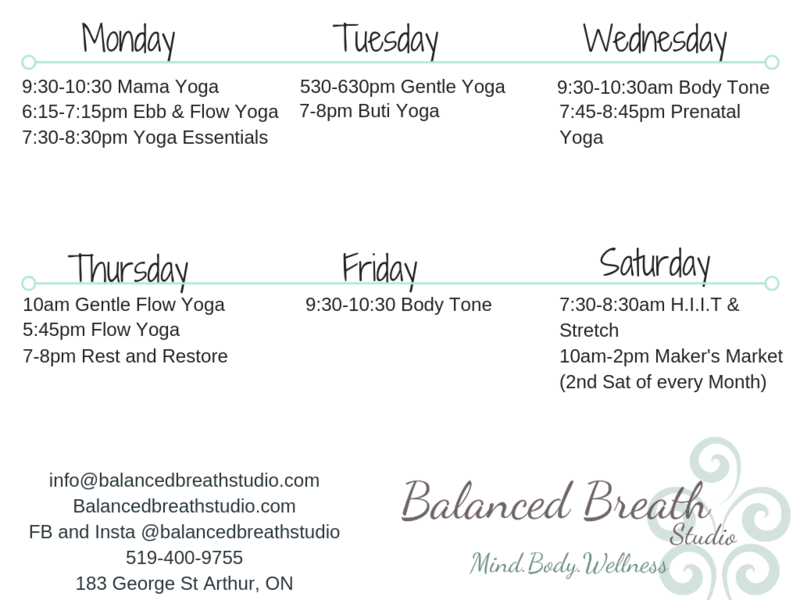 A breath and body awareness practice, welcoming any and all levels. Using props such as bolsters, blankets and blocks you will be guided through a series of lengthening yoga poses that are held for longer amounts of time. Allowing the body to fully relax into each pose, and to soak up every ounce of sensation and benefit they have to offer. For a well rounded fitness and wellness routine, Rest and Relaxation is key. Invigorate and Re energize your mind body and soul for the week ahead. This practice is flowing, strengthening and energizing. Salute the sun and rise and shine with a wonderful yoga practice with Kristina! Yoga for expecting moms. Prepare your body and breath for your big upcoming event. This is a class to bond with your growing life inside you and to take some time to relish the magic within. A flow practice that builds range of motion and flexibility through flowing yoga poses. This practice can be modified for all levels and everyone is encouraged to go at their own pace. A fast flowing, booty shaking, chakra bursting dance practice. There are disco lights, bangin' beats and poses variations that will make you sweat, smile and sing. This flow is inclusive of all levels but some basic yoga experience is recommended. In this series we will discuss the diaphragm and how it affects alignment, the importance of core engagement and balance, stretching whats tight and strengthening what is weak and more. This class is a moderate to intermediate level yoga class. A vinyasa style flow with functional movement and strength based flows and holds are included. This class is here to help you gain strength, alignment and flexibility in your body through active flows and engaging holds. Of course- Savasana is included! Go back to the basics of your yoga practice with yoga essentials. This class is great for beginner to moderate level yogis who want to dive a little deeper into the poses and 8 limb path of yoga. This class is more breath focused, slower paced and gives deeper insight into anatomy and biomechanics in each pose. You tone by building muscle, and to build muscle you've got to lift weights! Keep your metabolism lit up by learning how to work with weights. This will always be at your own pace and allow you to do the work out in a casual crowd. We start with a warm up, full body lifting session and end with some flexibility. Women are encouraged to come with or without children. Just like Mama Yoga, this class is inclusive to people who need to bring their babes! A gentle yoga practice for any practitioner looking to gain deeper range of motion and find relaxation in the body, mind and soul. This class is suitable for all levels include people with limitations. Feel free to reach out ahead as chairs and other props can be provided to make the class more inclusive. A moderate paced flow class with options for most levels. Must be able to get up and down from the floor comfortably. Lots of movement, flowing, standing, balancing lying and seated postures. This is a total body strengthening and stretching that focuses on alignment and breath. Located at the Mason Hall in Drayton. 65 Wellington St s.
Join us starting March 9th, and every second Saturday of the month after that, for our monthly Makers Market! We will be hosting up to 6 vendors in the studio in Arthur at 183 George St. Our hope is to provide a platform for businesses who otherwise go unseen to be able to have a place to showcase their products and their business to customers in the local area. All vendors and customers are welcome! Let's make this a time for collaboration, connection and community here in our studio. Are you a crisis meditater? Do you feel like you have no idea what you're doing when you sit down to meditate? Join Heather Reeves on a journey to getting past the unknowns and learning how to sit with yourself for meditation. Gentle yoga, breath work and meditation work included. How cool would it be to know what potential your life holds? How amazing would it be if you knew how to decode your life's biggest mysteries? Shine a bright light on your birth chart with me with this awesome online workshop. In this 3 hour class you will learn all the basics of reading a birth chart. 5 Class Package with a 6 week expiry. There will be no refunds and no extensions once purchased. This class pass will expire at the end of 6 weeks, however, you will be able to roll your classes over into another package should you renew after expiry. This does not include special events or workshops. 9 Class Package with a 6 week expiry. There will be no refunds and no extensions once purchased. This class pass will expire at the end of 6 weeks, however, you will be able to roll your classes over into another package should you renew after expiry. This does not include special events or workshops. 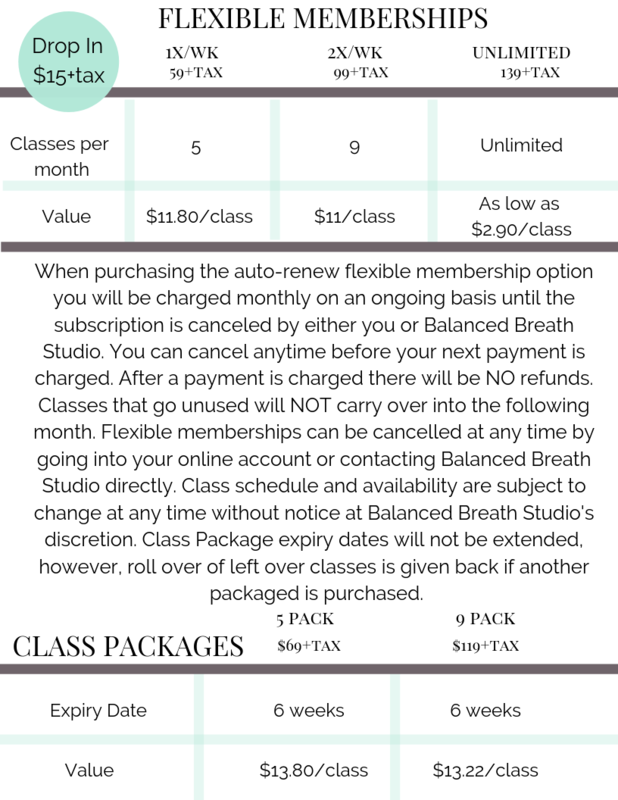 This package allows unlimited classes per month. Included in this package will also be a 1:1 consultation/personal training session to help you with your goals/form/nutrition questions etc. Included in this package is also the option of having an online personal training account to help you manage your workouts and nutrition outside of your classes. If you purchase on the first your credit card will be billed again on the following first of the month. This membership style subscription will continue until it is cancelled by YOU or Balanced Breath Studio. This package allows a total of 5 classes per month. If you purchase on the first your credit card will be billed again on the following first of the month. This membership style subscription will continue until it is cancelled by YOU or Balanced Breath Studio. This package allows a total of 9 classes per month. If you purchase on the first your credit card will be billed again on the following first of the month. This membership style subscription will continue until it is cancelled by YOU or Balanced Breath Studio.